Metal shingles that look like asphalt shingles, wood shake, or tile! Warrantied for 50 years. A Stone Coated Steel Roof is a semi-permanent solution that will last a lifetime. This product has been tested in nearly every climate condition on earth. At the core of every panel is a 26 gauge recycled steel core that is covered with Zinc-Aluminum alloys that prevent corrosion. Next, the steel roofing panels are flood-coated with a special acrylic polymer resin that provides a base layer for setting the Quartz Earth Stone granules. The Quartz granules are manufactured with a UV reflective coating provided by the 3M Corporation. The stone covered panels are then placed in ovens and baked until the desired bond is reached. Finally an acrylic glaze is applied to the finished product. Original installations from 1957 are still effective, proving that they’re a great value. Qualifies for discount on most insurance premiums. Highest hail rating possible. Covered for 50 years, transferable for the first 20. If your thinking of selling your home in the next 10-20 years, this product will still be looking great, whereas an asphalt shingle will be another bargaining chip for the buyer. It will stand out in the real estate market and a transferable warranty will be attractive to buyers, plus it increases the value of your home. Your attic temps WILL be lower compared to asphalt shingles, and some homeowners could save several hundred dollars every summer depending on the configuration. Great for houses with vaulted ceilings. Ask us for more information on the “double batten” system. These have been installed since 1957. They are huge in other parts of our country and overseas. Our area really needs to catch up in the sustainable roofing market and quit wasting materials. 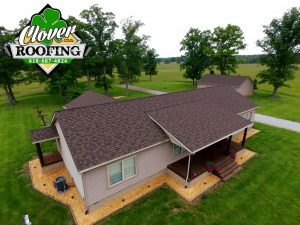 Ten year installation guarantee by a name you can trust: Clover Roofing. This product has many desired profiles & colors. They will remain looking good while your neighbors asphalt shingles fade, crack, curl, and get replaced multiple times. They are warranted against excessive granule loss and can be refinished if something were to happen to them later in life. Algae doesn’t feed on these like they do on asphalt shingles, but some will occur eventually. They are easily cleaned. Stone coated steel shingles weigh less than half as much as asphalt shingles. Interested in other types of metal? Maybe like Diamond Shape galvalume shingles? Affordable and used for over a hundred years in Europe. Call to find out more about why you’ve never heard of these great products. No, the stone coated steel design deadens the sound of the rain and even hail unlike a non-stone coated metal roof. No, many customers report a reduction in energy costs during summer and winter months. Also, a DECRA roof can be installed over an existing roof, providing additional insulation from temperature extremes. No, metal roofing is both an electrical conductor, and a noncombustible material. Absolutely, DECRA roofs are made of steel and designed to withstand the weight of people walking on them. You may, DECRA has a Class 4 hail rating – the highest rating UL offers. In many states, the Class 4 rating can earn a discount on homeowners insurance. Just ask your local agent for details in your state. No. Many customers report a reduction in energy costs during summer and winter months. Also, a DECRA roof can be installed over an existing roof, which creates even more insulation from temperature extremes. DECRA roof offers more value for your money. With a minimum 50 year life expectancy, you would have to purchase and install 2-1/2 shingle roofs for the cost of one DECRA roof. Like most products you buy, “you get what you pay for.” A DECRA roof offers more for your money. Itís no bargain to put two roofs on your house because the first one was “cheaper” and subsequently failed. A DECRA roof can last a lifetime. DECRA is also quite durable because the aluminum-zinc alloy coated steel enhances the superior weathering and corrosion resistance of each roofing panel. Is a DECRA Roofing System warranted? The best in the industry. DECRA Roofing Systems carry a Limited Lifetime Warrantyincluding 120 mph winds, hail penetration for any size hail and manufacturing defects – including excessive granule loss. In addition, material and labor are covered for the first 20 years after that time, material is covered the remaining warranty period. Yes, the water run-off from our products meets the World Health Organization Standards testing. However, rainwater is variable across regions; atmospheric conditions should be considered in actual use. Water collected during the first or second rain fall after extended dry periods can be contaminated by dirt accumulation. Deterioration of the coating takes place when there is exposed, uncovered basecoat; granule size- smaller or larger- does not ensure better coverage. No, DECRA’s product profiles and attractive ceramic stone granules do not resemble the standing seam roofs of the commercial industry; they add value and curb appeal to any roofing installation. Contact us today for a FREE ESTIMATE or call (618) 687-4824.